Much research into financial contagion and systematic risks has been motivated by the finding that cross-market correlations (resp. coexceedances) between asset returns increase significantly during crisis periods. Is this increase due to an exogenous shock common to all markets (interdependence) or due to certain types of transmission of shocks between markets (contagion)? 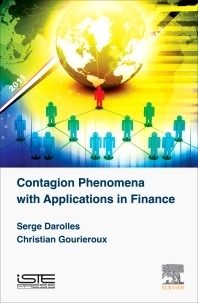 Darolles and Gourieroux explain that an attempt to convey contagion and causality in a static framework can be flawed due to identification problems; they provide a more precise definition of the notion of shock to strengthen the solution within a dynamic framework. Upper-division undergraduates, graduate students, and researchers working on market linkages, pricing and risk management in financial markets and industries. Serge Darolles is Professor of Finance at Paris–Dauphine University in France, and member of the Quantitative Management Initiative (QMI) scientific committee. His research interests include financial econometrics, liquidity and hedge fund analysis. He has written numerous articles, which have been published in academic journals. Christian Gourieroux is Professor at the University of Toronto in Canada, and Chair of the Finance Laboratory at the Center for Research in Economics and Statistics (CREST) in Paris.